A Le Mans winning Jaguar, a prewar Alfa Romeo, Bugattis, Ferraris and very special Shelbys are the leading cars at the 2016 Monterey week classic car auctions. RM Sotheby’s is offering two cars with estimates of $20 to $25 million: the 1956 Le Mans 24-Hours race winning 1955 Jaguar D-Type and a fabulously beautiful 1939 Alfa Romeo 8C 2900B Lungo Touring Spider. The top results at the Gooding and Company’s Pebble Beach 2016 sale are expected from a 1959 Ferrari 250 GT LWB California Spider Competizione (estimate $18 to $20 million) and a 1960 Ferrari 250 GT SWB Berlinetta Competizione (estimate $15 to $18 million). Bonhams lead car is Earl Howe’s 1931 Bugatti Type 51 Grand Prix Racing Two Seater (no estimate released). The first Shelby Cobra ever built is also attracting a lot of attention. The traditional mid-August classic car sales are held on the Monterey Peninsula in California, USA, from 18 to 20 August 2016. Gooding & Co with classic car sales on August 20 & 21, 2016, as official auction house of the prestigious Pebble Beach Concours d’Elegance. Mecum with classic car sales at the Hyatt Regency Monterey Hotel and Spa Del Monte Golf Course from 18 to 20 August 2016. Although there have been many signs of weakness in the classic car market in 2016 compared to the previous years, well over 120 cars enter the Monterey 2016 classic car auctions with upper estimate in excess of a million dollar. Around 50 have upper estimates higher than two million dollar. Although several high-profile cars failed to attract bidding above the reserve estimates in 2016, and weakness particularly noticeable at cars selling for around a million dollar, several cars are offer may set records should the estimates be reached. RM Sotheby’s lead car at the 2016 Monterey classic car week sales is a 1955 Jaguar D-Type (estimate $20 to $ 25 million). This car’s main claim to fame is winning the 1956 Le Mans 24-Hours race outright as an Ecurie Ecosse entry. It is also the only Jaguar Le Mans-winning C or D-Type to have survived intact in its original form. If the Jaguar sells at, or near estimate, it is likely to break at least two significant records: the most-expensive Jaguar ever (the current top result is $13,200,000 paid for a 1953 Jaguar C-Type Works Lightweight at RM Sotheby’s Monterey 2015 sale) and the most-expensive British car ever (the current record is $14,300,000 paid for a 1962 Aston Martin DB4 GT Zagato at RM Sotheby’s 2015 New York sale). Note: The 1955 Jaguar D-Type sold for $21,780,000 as the most-expensive British car ever. RM Sotheby’s second lead car is the magnificent 1939 Alfa Romeo 8C 2900B Lungo Spider by Touring that comes with the same $20 to $25 million estimate as the Jaguar D-Type. 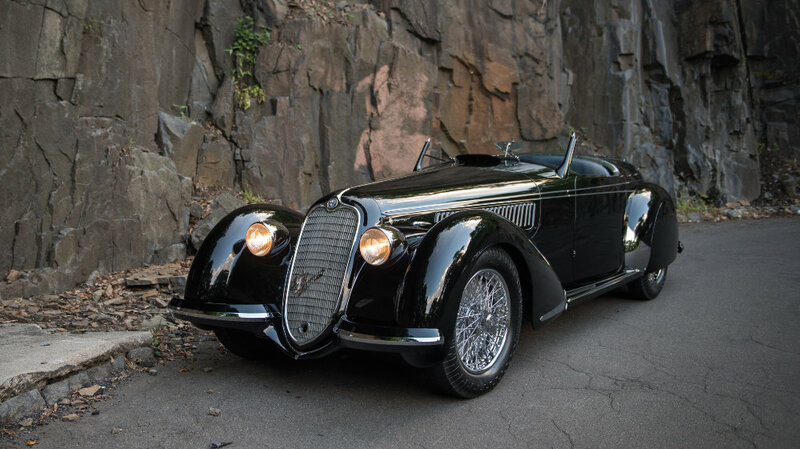 This exceedingly elegant Alfa Romeo – that RM Sotheby’s likes to compare with the Bugatti Atlantic – is rare car. Only 32 chassis were produced of which only 12 Touring Spiders are known to have survived. This car is likely to break two records: the most-expensive Alfa Romeo ever (current record is $9.8 million for a 1935 Alfa Romeo 8C-35 Grand Prix Racing Monoposto achieved at Bonhams Goodwood Revival 2013 sale) and most-expensive pre-war car ever at public auction (current record is $ 11,770,000 paid for a 1936 Mercedes Benz 540 K Spezial Roadster at Gooding’s Pebble Beach 2012 sale). If this Alfa Romeo fails to sell, the 1933 Alfa Romeo 8C 2300 Monza on offer at Gooding with an estimate of $12 to $15 million may also be in a position to break both those records. Bonhams also has a vey special Alfa on offer: a 1949 Alfa Romeo 6C Platé Special (estimate: refer to department). Parts of its history are open to speculation and the car is offered rather daringly without a reserve. If the Jaguar and Alfa Romeo failed to clear the reserves, Ferraris are most likely to move into the top results at the Monterey 2016 auctions. Some fine examples will be on offer. The exceptionally rare 1959 Ferrari 250 GT LWB California Spider Competizione (estimate $18 to $20 million) is likely to improve on the record $11,275,000 paid at Gooding Pebble Beach 2012 for a long-wheelbase California. (The record for a SWB is $18,650,000 paid for the Baillon Ferrari 250 GT SWB California Spider at Artcurial Paris 2015). It may also become the most-expensive car ever sold by Gooding – currently $17,160,000 for a 1961 Ferrari 250 GT SWB California Spider at Amelia Island 2016. This alloy-bodied California Spider is offers in the silver livery and number 17 that it used when finishing 5th overall at the 1960 12-Hours of Sebring race. The 1960 Ferrari 250 GT SWB Berlinetta Competizione (estimate $15 to $18 million) is offered in the livery used by the NART team when it finished 7th overall at Le Mans in 1960. The 1962 Ferrari 250 GT SWB Berlinetta (estimate $10 to $12 million) is a late production lusso model that was restored to concours condition in 2010. The 1962 Ferrari 268 SP by Fantuzzi (no estimate given) is one of six built and was integral to the testing of Ferraris racing cars for Le Mans. It was an official Ferrari works entry at Le Mans in 1962 but retired early. It was subsequently raced by NART in the Americas and was later part of the Bardinon Collection. The 1956 Ferrari 250 GT Berlinetta Competizione Tour de France (estimate $7 to $9 million) was the second of the series built and one of only nine wearing the original style bodywork. The car raced in the 1956 Mille Miglia and 1959 Tour de France series. Bonhams lead car is the 1931 Bugatti Type 51 Grand Prix Racing Two Seater that was entered into competition by Earl Howe and driven by amongst others Pierro Taruffi and Tazio Nuvolari. No estimate was released. Gooding also has a top Bugatti on offer at Pebble Beach 2016: a 1922 Bugatti Type 55 Roadster (estimate $10 to $14 million). This car was the works entry for the 1932 Mille Miglia race and still wears its original body. Two modern Bugatti Veyrons will also be available: a 2012 Grand Sport (estimate $1.7 to $2 million) at Bonhams and 2006 16.4 at Mecum. Prices of Porsches have risen dramatically in recent months and although there won’t be any Le Mans winning Porsches at Monterey, a few may still get multimillion results. A 1958 Porsche 550 A Spyder (estimate $5 to $6 million) – a works entry that finished fifth overall at Le Mans. The 1979 Porsche 935 (estimate $4.5 to $5.5 million) that Paul Newman famously raced at Le Mans to finish second overall. Other Porsches that are expecting to sell for over a million dollar include a Porsche 918 Spyder Weissach, a couple of 959s and 964s while several Porsche 911s and Carrerat GTs are also on offer. The first Shelby Cobra, chassis CSX2000, ever built will be on offer at the RM Sotheby’s Monterey 2016 sale. This 1962 Shelby 260 Cobra remained in the ownership of Carroll Shelby and is likely to set new records for the marque – no estimate was released. Standard Cobras generally sell for just over a million, a racing Cobra is likely to fetch above $2 million while a Super Snake sold for over $5 million at Barrett Jacksons Scottsdale 2015 sale. At least five further Shelby Cobras will be on offer during Monterey Week with estimates ranging from $725,000 to $2.6 million. Note: The 1962 Shelby 260 Cobra sold for $13,750,000 as the most-expensive American car ever.